I don’t know why, but when I spotted a pack of puff pastry on the reduced shelf this morning, I chucked it into my trolley and made my way to the checkout. When I arrived at home, I had no clue what to do with it. A savoury tart, freeze it or maybe a sweet little afternoon treat for Amy and me? 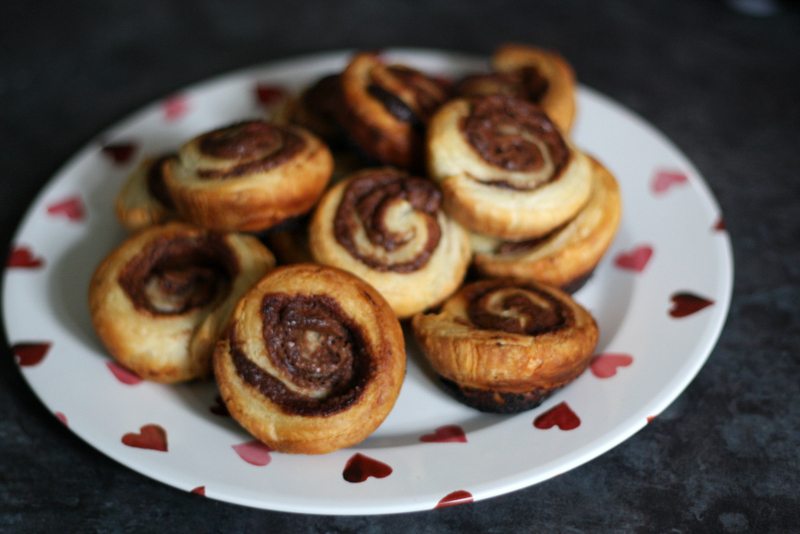 In the end, my sweet tooth won and I decided to make some Nutella Swirls for us. 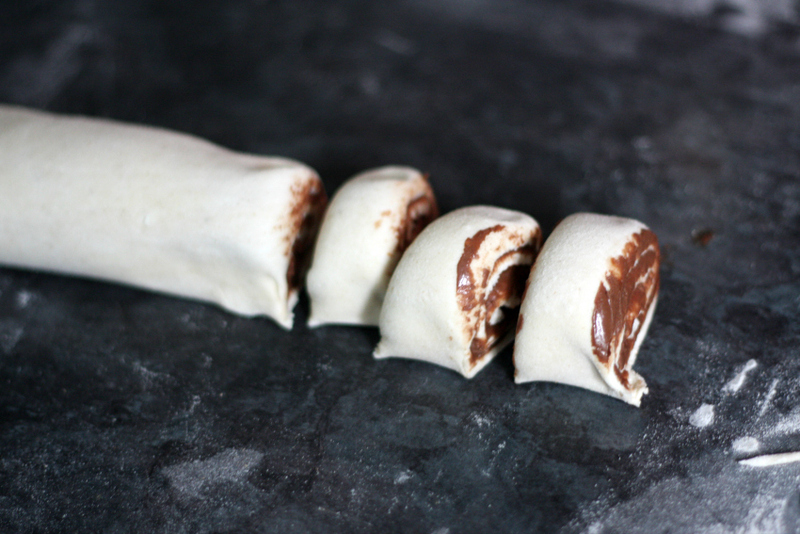 They are really quick and easy to make and perfect, if you have unexpected guests or just a craving for something sweet. 1. Preheat your oven to 220C/Gas Mark 7 or 425F. 2. Dust your work surface with some flour and roll out your puff pastry. Gently spread some Nutella all over the pastry sheet and sprinkle some chopped hazelnuts over the chocolate (hazelnuts are optional). 3. Roll the pastry sheet into a sausage shape and trim the edges off. Cut into 12 slices. 4. Push a slice each into the hole of a muffin tray and bake for 15 minutes or until crispy. 5. 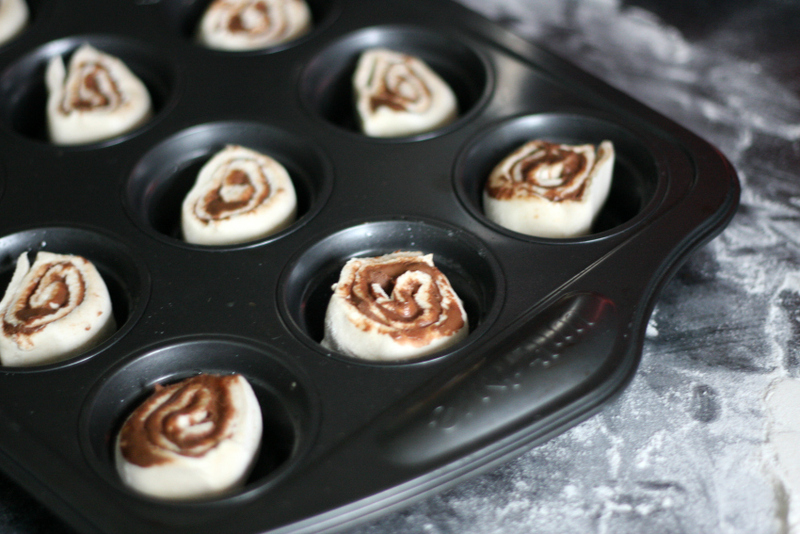 Take your Nutella Swirls out of the muffin tray and leave to cool a little before serving. 6. 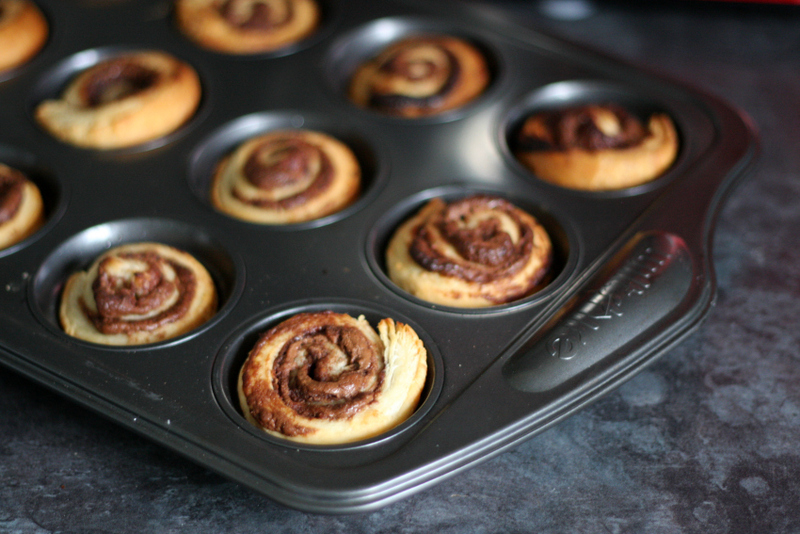 Enjoy while they’re still a little warm or dust with icing sugar once they’ve cooled down. One word – yum! They look amazing. oh my girls would love them! i like that you put them in the cupcake tin. Lovely! Oh yum! We’re big Nutella fans in this house. Wonder if I could get away with these for breakfast?! 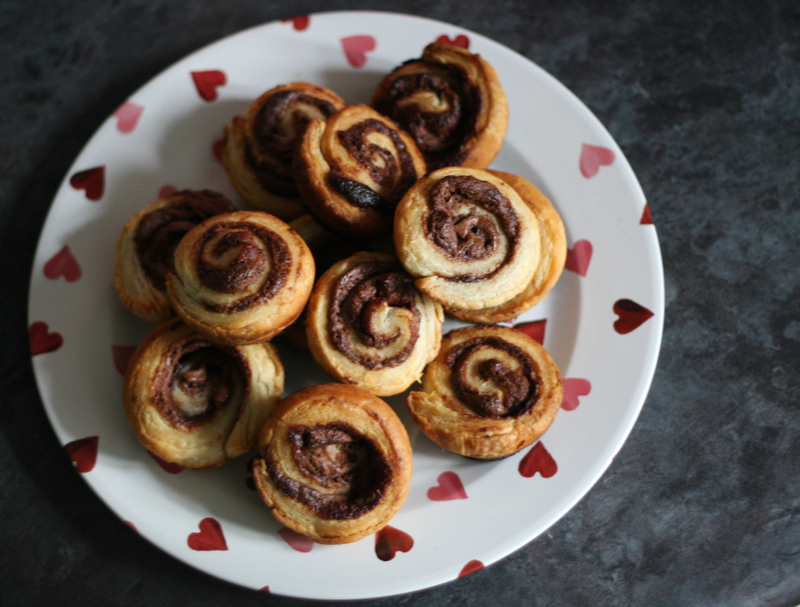 I have a pack of puff pastry in the fridge at this very moment, I just need to get another jar of Nutella. I can see me making these very soon. They look so delicious. I love puff pastry & a couple of these would go down a treat! Thank you 🙂 I couldn’t believe how quick and easy it was to rustle these up. I’ll definitely get a little more creative with pastry now. Oh my word…. GENIUS! Nutella make everything better! My youngest is just going to love them – thank you for sharing. No no noooooo why did you bring these into my life?!?!?! Oh my goodness they look so good, and more importantly, they look like something I might actually manage to make! Mmmm, quick and tasty, perfect! These look really good and simple to make too, one we will try in the half term holidays (can foresee a lazy late breakfast ahead). Friday Foodies. 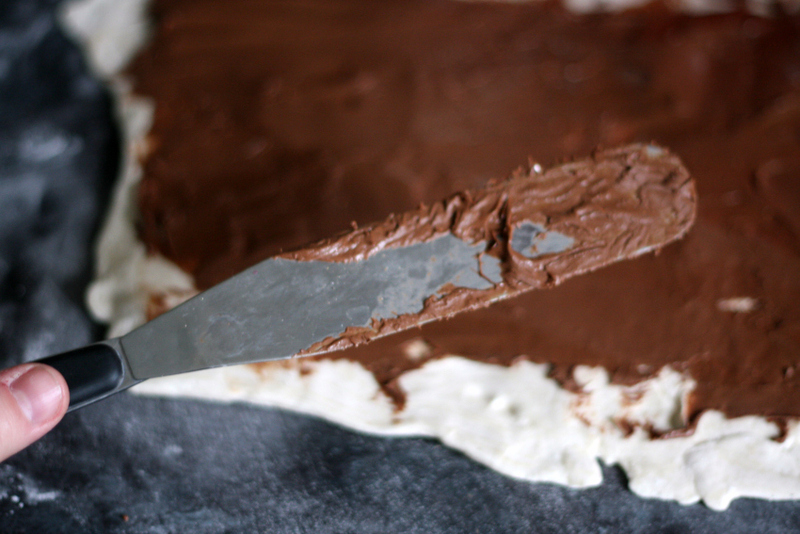 My daughters eat Nutella right out of the container with a butter knife. So I know that they would love these as well! Really simple to make but they look really good! Thank you for the recipe, I’ll have to try this for the next snow day we have! Thank you for your post.